Graybeard Outdoors > Handgun Forums > Double Action Revolvers > Full Moon Clip Conversions? everyone is welcome to an opinion but id have to ask why. Ive carried those thin clips in moon clip holders in my jacket pocket and in my front pocket of my pants and never bent one carrying it or even rattling around in the glove box of my jeep or shooting box. I bent exactly one and that was unloading it without the proper tool. It was easy enough to bend right back again. Probably no more fragile then the feed lips on your mags or a plastic speed loader (which I have seen fail to work) Might damage one if you fall out of a 2 story window or get hit by a car but then that would be the least of your worrys. If your worried that the sky is going to fall you still can use speedloaders on a cyl cut for clips or use nothing at all. Only ammo that demands the use of a clip after the gun is cut is a 45acp. My S&W Govonor uses the clips I had for my 625 . The Ruger Redhawk on the other hand requires thin clips and they are weak. I would never use them for self defense. Well, I jumped and my cylinder is on it's way to be cut for the full moon clips. I'll update with a review when it's back in my hands. Lloyd the ones for S&W are made well the ones for Ruger are not so good. I have both and that has been my experience. I had to buy the special thin ones for my alaskan for 45 colts and 454s. The standard ones worked for 45acps. Sure you could bend them if you wanted too but its actually pretty tough to imagine a loaded clip being bent in your pocket. I didn't carry them 24/7 for 10 years but did on many occasions carry that gun with a couple extra moon clips in my pocket and never saw one bend or get damaged. 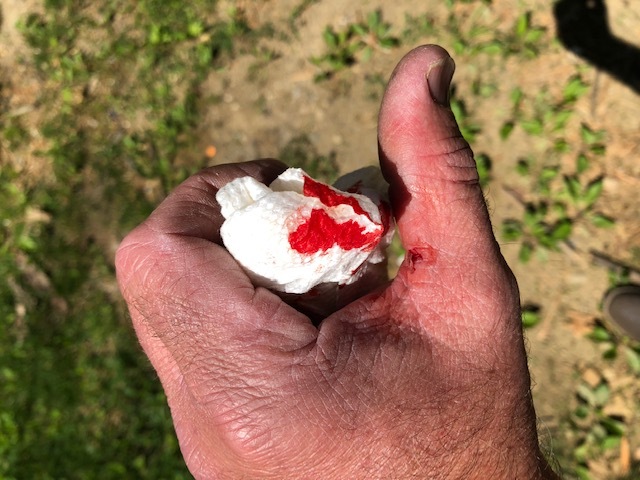 Now I will concede that ham fisted loading and unloading of them can damage them easier then the thick ones but if you use the proper tool to load and unload them its a non issue unless you are the type to use one for a screwdriver ect. Or your asked to co star in a remake of last man standing. My guess is any blow which could bend any moon clip in your pocket is hard enough that youd better check your speedloaders too. There disadvantage is there plastic and mechanical and we all know what that means. Last edited by lloyd smale; 03-01-2019 at 06:59 AM. Promised an update on my conversion. I shipped the cylinder out on a Monday, TK Custom received it end of day Thursday, it was on it's way back to me Friday. Got it home and back on the 629 and everything worked flawlessly. I had also done an action job and replaced springs while I had the gun apart, so it required a trip to the range to dial things in. I ran about 100 rounds of mixed .44 reloads through it on Sunday, .44 Mags, .44 Specials, and .44 Russian. The clips work amazingly well. The magnum length rounds need a little attention to the alignment due to the OAL, but the specials and Russians pretty much drop in. I'm pretty happy with the conversion so far, and if anyone is on the fence about it, my advice is to jump, you won't regret it. very very cool little gun. Id be proud to own it. Years ago in New Mexicoi owned a Lewis Horton edition model 29 in 44 mag. It was blued back then with 3” barrel. I also owned a 8 & 3/8” model 29. Made a nice pair of shooters. Thank you Lloyd, that is a great complement. The idea for this revolver has been on my mind for a long time, starting with an article that I read in American Handgunner back in June of 1988. Massad Ayoob wrote an article entitled "4x44", where he extorted the benefits of a 4" 44 Magnum, and one of the guns he talked about was one chambered for a wildcat cartridge called a ".44 JAG", which was made to approximate the .44 automag and be able to be used in a wheelgun with the full moon clips. 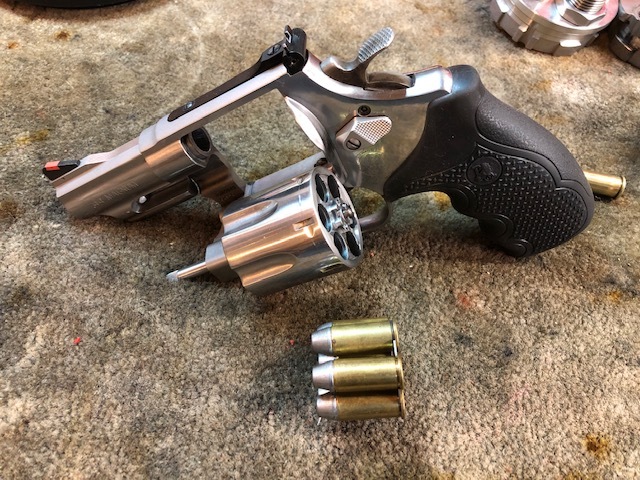 Since that day, the idea of a handy .44 mag revolver has been in the back of my mind, and I've ran the gamut of 4" Smith and Wesson revolvers, 4 5/8" Ruger Blackhawks, Super Blackhawks, Vaqueros, and I even cut down the barrel on a Redhawk to 4" (before Ruger started making them factory). While all these were good, they just didn't fit. This summer I fell for the 3" 629, and started shooting it frequently. I realized pretty quickly that if I was wanting to run warmer loads, the pretty wood grips had to go. I added the Pachmayr grips, and then made the decision to have the cylinder cut for the clips. When I got it back and hit the range, I realized that I have finally achieved my goal. It's a handy .44 Magnum, controllable with the cushioned grips, able to be reloaded quickly with the full moon clips, and just what the Doctor ordered. I can shoot light loads (.44 Russian), medium to warm loads (.44 Special) or warm to 'stupid' loads (.44 Magnum). This one will stay in my possession until I'm done with guns. 3 inch smiths are just plain cool. Passed up a 3 inch mod 29 some years back . Wish I had it.